And there was another incident on August twenty-first in the area of Ceibo Chico. This time FCD rangers, Police and B.D.F. 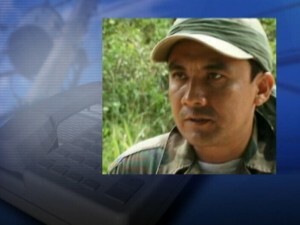 personnel came under fire as they approached about fifty Guatemalans panning for gold in the Chiquibul. There’s been no official report of the incident from the Ministry of Foreign Affairs, but according to Manager of the Chiquibul National Park Derrick Chan it was a tense and dangerous situation. News Five asked Minister Wilfred Elrington about the incident. He told us that he is on holiday so hasn’t been briefed. We have been able to confirm that six Guatemalans were arrested and handed over to the San Ignacio Police. They are reportedly on remand at the Belize Central Prison. Useless pm and gov. This man Elrington is a total waste of time while the country is being plundered he is in vacation and doesn’t know anything about what’s going on in the country what incompetence damm.